Webistan Photo Agency » Blog Archive » Eastern Turkistan or Xinjiang? Following a weekend of violence in China’s farwest region, Xinjiang, at least 160 people have been reportedly killed and more than 800 others injured. Xinjinag meaning “new territory” in mandarin, is a rugged region of vast deserts and mountains that borders central Asia and is home to ethnic Uyghurs, a Turkic-speaking people with closer cultural links to their Central Asian neighbours than the Han Chinese. For five decades, communist China has strenghtened its control on this oil-rich and economically vital region. Even though China’s constitution claims that it guarantees equal rights for ethnic minorities, tensions run deep. Uyghurs, a Muslim group still comprising a majority of Eastern Turkistan’s (the region’s original name) 20 million people, have long complained of discrimination and unfair division of the region’s resources with the Han, who make up more than 90 percent of China’s 1.3 billion people. China accuses separatists of terrorist acts, including attacks on police and bombings last year, and has drawn parallels between its attempt to fight the groups with the U.S. war on terror. 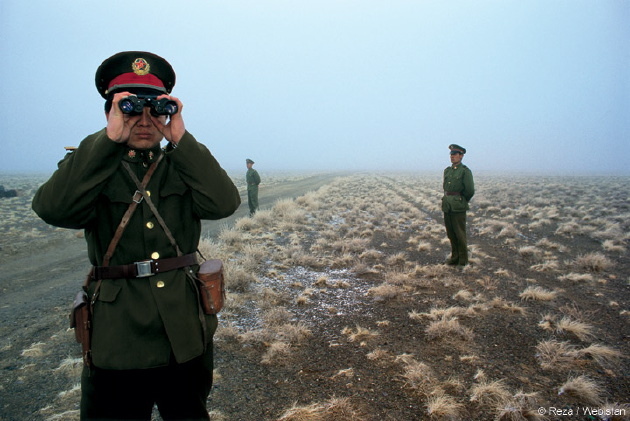 After more than fourty years of isolation, Reza was the first foreign photgrapher to visit the region and bring up an indepth sight of Xinjiang/Eastern Turkistan. In 2008, thirteen years after his first visit, he renewed a rare retrospective of this forgotten people and land.